Turns out that preserved lemons are my new favorite condiment. For the rest of December and through the early part of January, I was finding ways to work preserved lemons into every savory dish I made: baked fish with herbs, roasted vegetables, and pastas. My favorite combo? Soba noodles tossed in olive oil and this twist on gremolata: roasted garlic, sautéed preserved lemon, minced parsley, and a sprinkling of crushed red pepper. Topped with freshly grated cheese, of course. If you read my post about Lemonpalooza a couple of weeks ago, let me tell you that the abundance of over-the-fence Meyers and backyard Eurekas continues! After some hemming and hawing about it, I finally decided it was time to make my own preserved lemons. I’m still baby-stepping my way into preserving foods. If you’re in the same boat, preserved lemons are a good place to start. There’s no cooking involved, although it’s a good idea to sterilize the jars in which you’ll store the lemons while they do their thing for 30 days. Oh, yeah, that’s the kicker: you have to wait 30 days. There are a few variations of preserved lemon recipes floating around the interwebs, but Paula Wolfert’s version seems to be the mother recipe; you can find it on Epicurious and Leite’s Culinaria. The Leite’s Culinaria version is more concise, while the Epicurious version provides more detail and includes notes from Wolfert. Read both to get the full picture. To paraphrase one comment I read: “if you’ve got salt and lemons, you can make preserved lemons.” Yep, it’s that easy. I decided to go with the spices-added version from Epicurious. 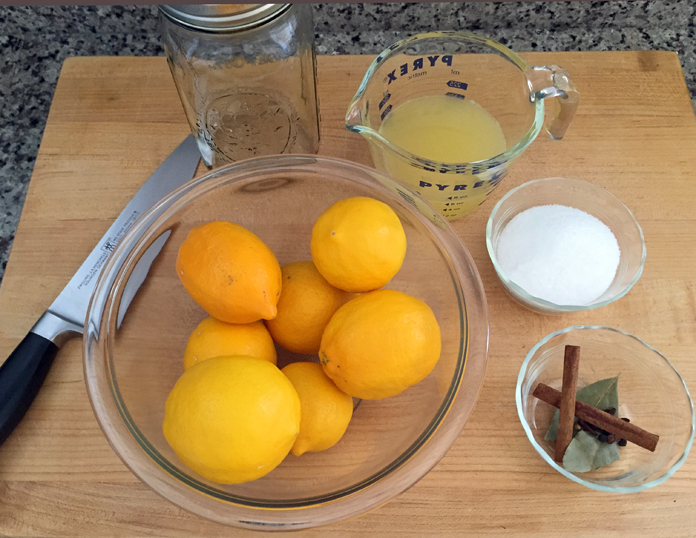 Because I have 24-ounce jars and plenty of lemons, I scaled up the recipe to make 1.5 times the amount (just multiply every ingredient by 1.5). I don’t have permission to post the recipe here, but I can give you the peep-show version of what I did. First up: the mise en place. Make sure you’ve sterilized your jar(s) and assembled your ingredients. Tip: Sharpen your knife before starting. 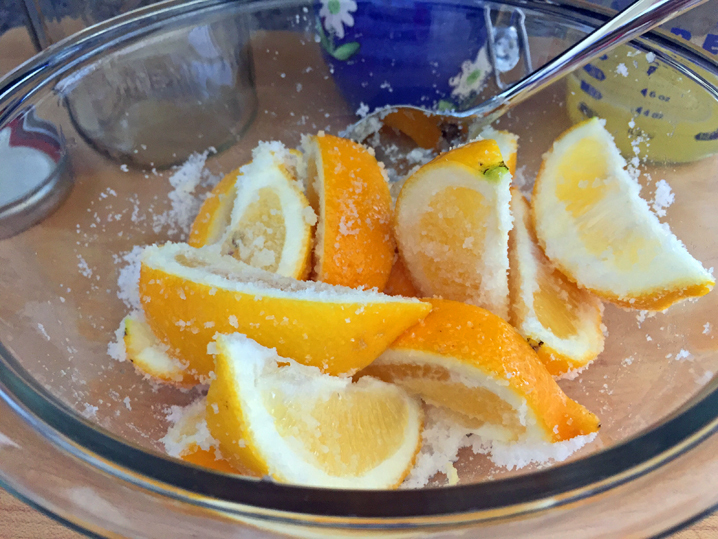 It’s a lot easier to slice through citrus peels with a sharp knife. I used the muddler from my home bar to press the salt-stuffed lemons into the canning jar and force out some of the juice. 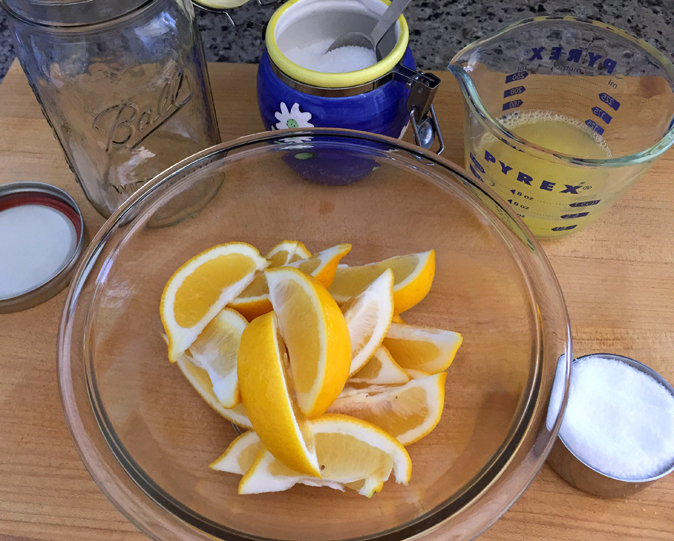 After I layered all of the lemons and spices into the jar, using the muddler to press down each layer, I added lemon juice to cover everything. (Remember those 10 Meyer lemons I zested to make limoncello? I used the naked lemons for the juice to cover my preserved lemons.) Et voila! There’s also a recipe for a seven-day version of Paula Wolfert’s preserved lemons on Epicurious. Not as highly rated, but easy-peasy to make. Hey, I had more lemons, juice, and another jar… not to mention all of that above-cabinet storage space, so I knocked that one out, too. It will be interesting to compare the quickie version with the long, slow version. Mise en place: no spices in this one, just lemons, salt, and juice. The seven-day version: simpler and faster. But does it taste as good? Another difference? The prep is super quick. 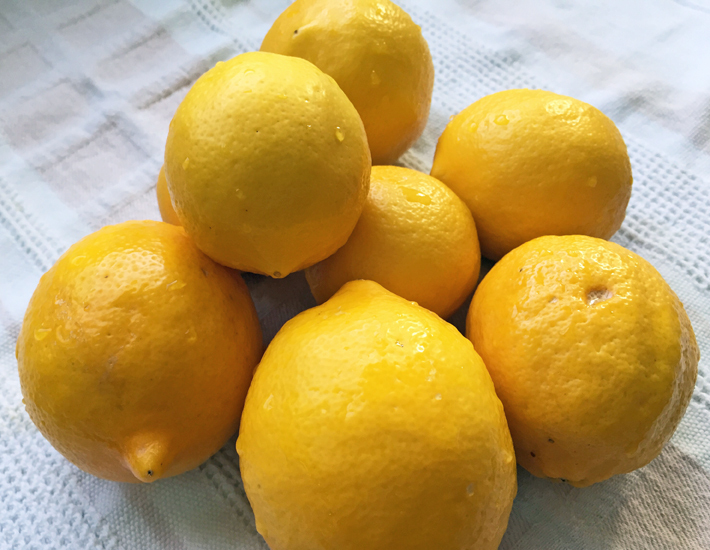 When making the seven-day version, you cut the lemons into slices and toss them with salt. In the 30-day version, you cut the lemons just enough to stuff them with salt. Next week I’ll have the quickie version ready for taste-testing. You’ll be able to check out the results on 650Food’s Facebook page! Have you made preserved lemons? What are your tips or favorite recipes using this flavorful condiment? 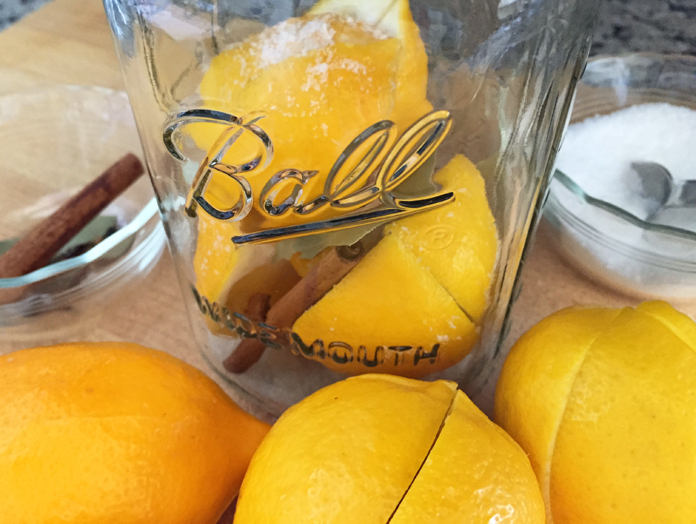 I’m just circling back to let you know how we used our preserved lemons. The gremolata was delicious — it fed a whole family very happily. But the biggest discovery was what happened when we combined the lemons with feta. We’ve been buying our feta from Rose International Market on Castro St. in Mountain View for 20+ years. They always stock 3 to 4 kinds of fresh feta behind the counter, including Greek, French, and Bulgarian styles, for between $4 and $5 a pound. The other day I lightly mixed a wedge of preserved lemon with a little bit of leftover Bulgarian feta and served it with crackers and lavash (also from Rose Market). The resulting spread was just heavenly. I didn’t think it was possible to improve Bulgarian feta, but I guess you never know! Monica, thanks for sharing — glad that your family enjoyed the gremolata. I know what tough critics the younger family members can be, so if it was a hit with them, then that’s saying something! 🙂 I love the idea of combining preserved lemons with feta — so simple and tasty! I’ll have to give it a try myself. And thanks for sharing the deets about Rose Market. It’s great to hear about a long-running family business in the 650 that’s selling good products and has a loyal clientele. 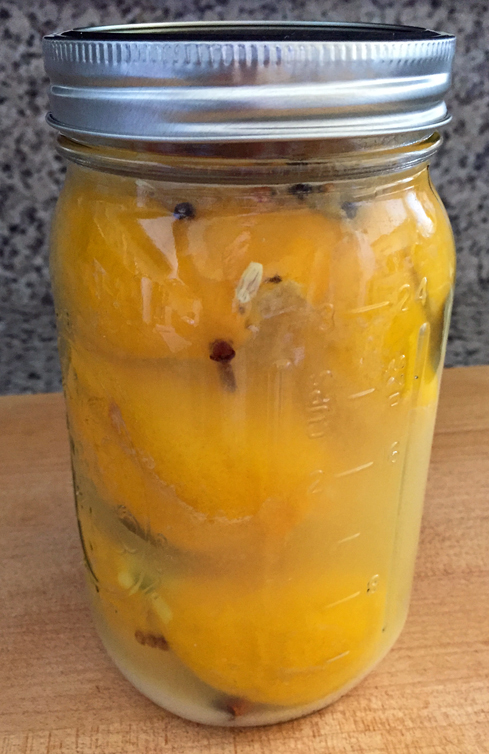 You are currently reading Waste-Less Wednesday: Preserved Lemons at 650Food.